SI.com talked with new Buffalo coach Lance Leipold about his approach, the challenges and opportunities that the Bulls present and more. The bar is set pretty high when you have a 109-6 record as a head coach. But there’s also a standard of excellence and consistency there, and that’s exactly what Lance Leipold is hoping to bring to Buffalo in his first year with the Bulls. Leipold took over for Jeff Quinn, who was fired mid-season and replaced by interim coach Alex Wood. He’s tasked with bringing the same winning mentality that led Wisconsin-Whitewater to six Division III national titles in eight seasons to a Buffalo program that won 13 games over the past two seasons and produced the No. 5 draft pick, Khalil Mack, in 2014. With Signing Day in the rearview mirror, SI.com had the chance to speak with Leipold about his approach, the challenges and opportunities that Buffalo presents and his relationship with former Wisconsin coach and current Arkansas coach Bret Bielema. SI: You’ve had a little bit of time to really get things going, and you’ve got a Signing Day under your belt now, too. What’s the Buffalo experience been like for you so far? Lance Leipold: It’s been very exciting. I don’t know if the word “whirlwind” explains it. It’s been a fast few weeks. We’ve had a lot of things to get together. The month of December, trying to work with two programs was a juggling act of trying to be in a couple different places. But we were able to hit the ground running here in January and February for the most part. Our staff came together, and I thought we finished the recruiting year in very solid fashion with some late commitments. I’m excited about this new chapter in UB athletics with our athletic director Danny White. ​​SI: What’s been the biggest difference for you in building the program, your staff and what you’ve had to do to get things ready between Whitewater and Buffalo? LL: That’s still evolving, but the biggest thing is the recruiting aspect of things. You’re more locked into a definite number that you’re recruiting and the evaluation of that. What goes with it is the travel you have to do through that recruiting process on a weekly basis. I still believe strongly with staff and as a head coach in building those relationships and being able to articulate a vision and what that experience is going to be like for a student-athlete so his parents can understand that. SI: What was the biggest draw for you with Buffalo? A lot of other programs are more of a rebuilding project in a sense, but Buffalo did have 13 wins in the past two seasons, a top-five draft pick and some really nice pieces over the past few years. LL: You hit on some of those, and I mentioned earlier our athletic director Danny White. The first time we had a chance to talk, he talked about what his vision for this athletic department and university was. When I looked at some of the things that had been done here under coach Quinn — and probably I was a little closer knowing (former Buffalo coach) Turner Gill from my time at Nebraska — and what Turner was able to do with maybe not on the upper end of this conference in terms of facilities and what Danny’s plans as athletic director were to improve that situation, I felt it was the right fit and opportunity to take on the a new challenge to build a consistent winner. Like you said, it’s not a rebuilding, it’s more of a building a consistent program. That’s what we’re after here. SI: Consistency was definitely a mark of your tenure at Whitewater. 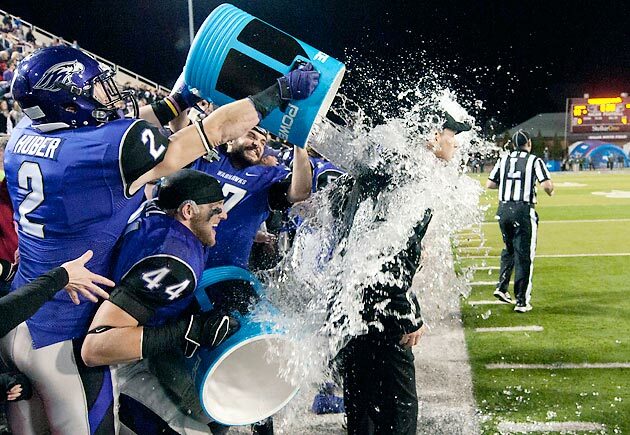 Are you going to miss playing (national championship foe for nine of the past 10 years) Mount Union at all? LL: I don’t know if I’ll miss playing Mount Union, but I’ll miss the process we went through to get there. A lot is made of that matchup, but I’m proud of what we were able to do consistently there. That those teams met as many times is one I hope will continue and will be looked upon in college athletics as something pretty special. SI: Looking ahead, what do you want your identity to be with Buffalo? LL: Much as we were at Whitewater, we’re going to be a physical, fundamentally sound football team that’s going to play hard for 60 minutes, one that will be multiple in what it does on both sides of the ball and one that our opponents will respect. They’ll feel they’re playing a well-coached team that plays the game hard. SI: When you were looking to put together your staff, what kinds of things were you trying to accomplish there? Was experience important, recruiting acumen, guys you had a prior relationship with? LL: It was a little bit of a mix, and when you look at the staff, there’s probably more of the latter statement there in a lot of the initial areas. Making the jump into things, I felt it was very important to have people I had some familiarity with and I knew and trusted not just as coaches but as people. For them, how they go about their business on and off the field was very important to me. There were some key people I targeted, whether it be from Whitewater or elsewhere. (Associate head coach) Rob Ianello was a very important cog in this thing because of his experience at the FBS level as a recruiting coordinator. He had a short stint as a head coach in the MAC, and he’s a New York native. D.J. Vokolek from Missouri State is someone I’ve known for 20 years and somebody I trust immensely as a coach. Much like I was given an opportunity to make a jump, I know there’s quality coaches at all levels of football. That was a very important piece to me that we could articulate to families and not just the recruit of the type of program and energy we would bring. SI: In attacking recruiting, is there a specific approach you want to take there. Is keeping kids in state important? Is there a type of kid you’re going after? LL: We want to do a great job in the state of New York, as the state’s flagship institution in what we have to offer. We’re the only AAU accredited university in the state not playing in a Power Five conference. We have an opportunity to sell a special place educationally and athletically for young men who fit the academic profile of this university. At the same time, we want to make sure we do a great job in Western New York. It’s going to start locally and then branch out from there. We need to do a great job throughout the MAC footprint. We have ties in Wisconsin and the northern Chicago suburbs as well, which continues that MAC footprint. Then we’ll look in the Atlanta and Florida areas for what we need. We’re multiple enough schematically that in what today’s student-athletes are looking for in experience and opportunity to show their talent, we’ll be able to accommodate those. I don’t worry about pigeonholing ourselves into something that way. SI: Have any coaches, either in the MAC or outside of the MAC, given you any particular advice that has stuck out with you since you’ve taken over? LL: A little bit. Somebody who has really reached out to me multiple times is Bret Bielema at Arkansas. Bret has offered everything he can do. After our last game at Whitewater, he flew out here for a couple days, and a couple days before Christmas I flew down to Fayetteville and spent the day with him. We sat down and had at least five or six hours of going through different things. I formulated a list of questions ahead of time, and we kind of went through those one by one. I couldn’t be more grateful for what he has done. SI: He didn’t want to lend you one or two of those big offensive linemen? LL: [Laughs] Some of those big linemen and maybe some of those athletes on the back end, too. For that, because I had a little bit of a relationship with Bret while he was at Wisconsin. For him to reach out and offer that as busy as his schedule is — it wasn’t me hounding him, it was more him extending himself to me. As I continue to learn and grow, I look forward to that. I’ve known Pete Lembo at Ball State for a long time. Of course I worked for Frank Solich at Nebraska. I’ve known (Northern Illinois coach) Rod Carey for a long time, too. There’s guys like that. I competed against (Eastern Michigan coach) Chris Creighton when he was at Wabash. There’s a little bit of familiarity through the league, but I know I’ve got a lot to catch up on.